One of the most important items in your wear to work wardrobe is your handbag. Let’s be honest, we all throw way too much stuff in our handbags and require them to do so much! 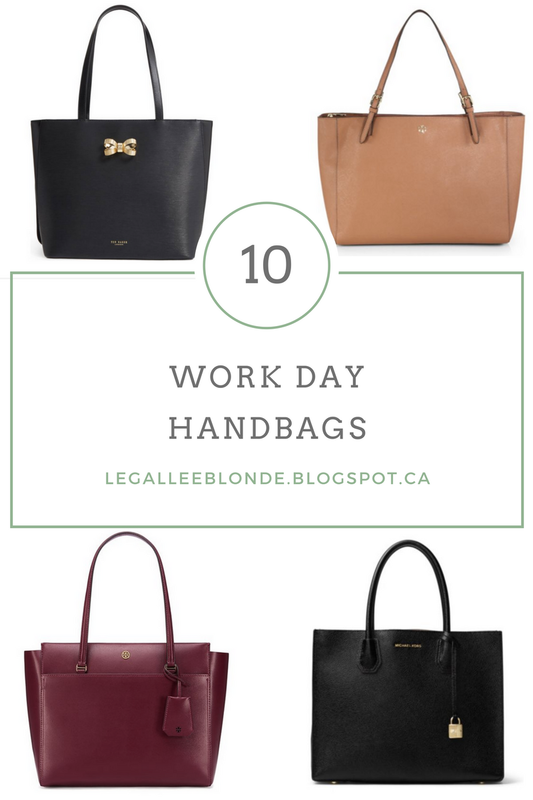 Today I wanted to share with you my top 10 bag picks for taking to you to and from the office. I’ve rounded up 10 choices at different price points and will talk about why each makes a great work day bag below! Don’t forget you can easily shop any of the handbag picks by scrolling through the widget at the bottom of the post as well. When it comes to a good work day bag my number one criteria is durability. All of the bags below can stand the test of time! My second main criteria is functionality. What I mean by that, is does the bag actually hold what I need it to, in an organized way. You’ll notice that almost every one of my top 10 picks has a zipper component (or a complete zip top). This is for that exact reason! It has never made sense to me why a big work day handbag would have an open top. It makes it way too easily to loose important things you may be carrying! Alright, enough of me talking – let’s get to the round up! 1. Ted Baker Larah Shopper Bag: The gold bow detail on this black leather handbag adds a trendy element to a classic, timeless bag. This leather bag is well made and lasts without starting to look worn. Also, it is a zip top making it perfect if you need to bring work files or documents to and from the office. 2. Rebecca Minkoff Midnighter Leather Work Tote: This bag is great if you want a work day handbag that breaks from the ordinary, but still looks work appropriate. The almond leather is gorgeous in person – a perfect cognac/almond shade and a supple smooth material. The gold studs had a western feel. This bag, again, has a full zip top – such a win!! This is also one of the smallest bags on my list, so if you are looking for a bag that can hold all your essentials, but is more of a shoulder bag size – this one is for you! 3. Rebecca Minkoff Always On Regan Tote: This “it bag” is actually a perfect work day bag – which can’t be said about most on-trend bags! This tote has the signature trailing tassels and is a chic dove grey color. It’s perfect for work because of it’s got a laptop sleeve, interior pockets for your phone and keys, as well as a small outside pocket for anything you may need to access to quickly (…starbucks card for morning coffee anyone?! No? just me?? haha) This bag also comes in at under $300 which is a great deal for an it bag! 4. Kate Spade Daniels Drive Tote: I *love* this bag. This bag comes in 4 colors -and honestly every single one would be great for a day at the office. Black cherry would be especially on-trend this season, while still being work appropriate. This bag has a snap top, with a ton of interior space and a pocket. The knotted detailing on the bag adds a fashion forward element. I also love the pebbled leather as a change! 5. Michael Kors Mercer Tote: This is the most expensive bag on this list (it is part of the Michael Michael Kors collection and comes in at just under $400). It is though, in my opinion, well worth it for the quality of the craftsmanship and the durability of this bag. The structured shape of this bag is ideal for work. I always recommend structured over slouchy bags when pulling together a wear-to-work outfit. 6. Tory Burch York Buckle Tote: This bag comes in a ton of colors – there is definitely a York tote for everyone. My favorites for a work day bag would be the black, navy, french grey or luggage. The luggage is actually a very light/warm tan shade in person and I have found it looks great with nearly every work outfit I come up with! This bag is probably my #1 pick on this list, especially for lawyers like myself!! This is one of the only handbags I have found that actually fits legal size (11×14) paper/folders! If you are a lawyer, legal assistant, paralegal, etc., you absolutely need this bag!! 7. ASOS Rose Gold Zipper Bag: At under $50 adding this bag to your work day handbag collection is a no brainer! I love the structured shape and the rose gold hardware really makes this bag pop. I like that it has a detachable strap so you can carry it or wear it over your shoulder if that’s easier for you when running out the door to the office! 8. Michael Kors Jet Set Travel Bag: Along with the Tory Burch tote, this is my other go-to bag. I would say I use either my Tory Burch or this Michael Kors Jet Set 9 days out of 10. In fact, I just shared a pic of this MK handbag on my instagram on the weekend! This zip-top bag holds so much – I routinely through in my laptop, a book to read, files for work, my wallet, and my makeup bag! I cannot recommend this bag enough! This new Tory Burch bag looks absolutely amazing! I can’t wait to get my hands on one and try it out. It appears to have so many of the things that I love about the York tote (including strong handles and beautiful color choices). It also though has a new design that I just love! The shape is so beautiful! 10. H&M Handbag: Last but not least I had to share this H&M basic. At under $40 this bag is the cheapest on this list, and is great if you’re looking to add a new black bag to your collection without your bank account taking a hit! H&M has had variations of this exact bag every season for the past three years. It is timeless and looks great with a business casual office outfit. Unlike the other bags on this list it does not have the durability factor (mine from last year lasted about 6 months) but for the price tag that is A-Ok by me! This bag is so great because of the double zip-compartments. Such a great way to stay organized!